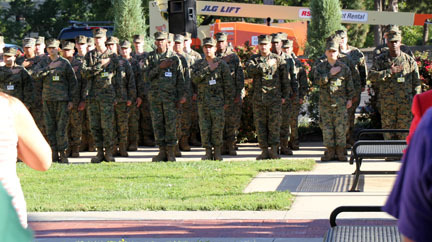 Marine JROTC cadets and others gathered this morning at Constitution Plaza on the grounds of Topeka High School in remembrance of the 9-11 attacks. As part of the ceremony, cadets read a script they created for the event, including quotes from prominent dignitaries. The bell used by USS Topeka CLG-8 that hangs at the school rang at the times when impacts occurred eleven years ago. Attendees joined in the Pledge of Allegiance. 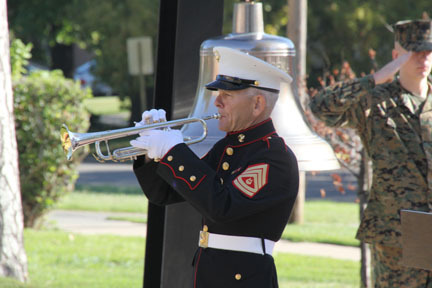 Taps was played by Marine Gunnery Sergeant Roger Stoner. Gunnery Sgt. Stoner was a student teacher at Topeka High School in 1967 just prior to his enlistment in 1968. From 1968 to 1972, he was stationed at the White House playing in the Marine Corps Band. He played for presidents Johnson and Nixon.